Growing out of President Bush’s own outreach and the ongoing work of the George W. Bush Institute's Military Service Initiative, Portraits of Courage brings together sixty-six full-color portraits and a four-panel mural painted by President Bush of members of the United States military who have served our nation with honor since 9/11—and whom he has come to know personally. Each painting in this meticulously produced hardcover volume is accompanied by the inspiring story of the veteran depicted, written by the President. Readers can see the faces of those who answered the nation’s call and learn from their bravery on the battlefield, their journeys to recovery, and the continued leadership and contributions they are making as civilians. It is President Bush’s desire that these stories of courage and resilience will honor our men and women in uniform, highlight their family and caregivers who bear the burden of their sacrifice, and help Americans understand how we can support our veterans and empower them to succeed. GEORGE W. BUSH is the 43rd President of the United States, serving from 2001 to 2009. He previously served as Governor of Texas. He and his wife, Laura, now live in Dallas, where they founded the George W. Bush Presidential Center at Southern Methodist University. 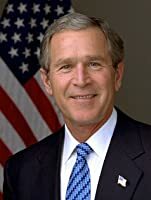 President Bush is also the author of two number one bestsellers: Decision Points, his presidential memoir; and 41, a biography of his father, President George H.W. Bush.